In popular culture, the ‘echo chamber’ is a moniker for circuitous news media and their attendant feeds, which are reinforced by a closed network controlled and governed by private sources, governments and corporations. It is also a metaphor for the historical dominance of capital and the cultural, social and political systems that dictate its access, production and distribution—this ‘capital’ wooing (and thus privileging) particular images, languages, skills, histories and geographies. 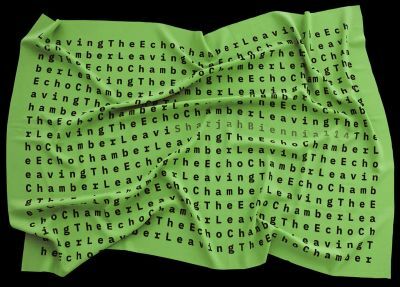 Most tangibly, the ‘echo chamber’ is the space wherein sound hits and reverberates, where memory and imagination echo across surface, across space and across time. production—its rituals, beliefs and customs. The fourteenth edition of Sharjah Biennial begs the viewer to consider a number of concerns. What does it mean to demand alternate images at a time when news is spoon-fed to us by a monopoly of sources? How do we expand our narratives by acknowledging what has been hidden or removed? How can we reflect on our own culturally located histories in an era when so many individuals have been forced to believe that they must surrender their own agency to the mainstream forces that exist and govern our world? The echo chamber could be construed as a modern-day Faraday cage—an enclosure that covers conductive material and prevents the transmission of signals. At Sharjah Biennial 14, artists are given the agency to tell stories that echo in different ways, thus creating new surfaces for a multiplicity of chambers that reveal numerous and multifaceted means of connecting, surviving and sustaining a collective humanity.